Above - A Google Streetview Image of the Granada, Tooting - Click to Interact. The Granada Theatre is situated on Mitcham Road in Tooting Broadway and was originally built for Sydney Bernstein's Granada Theatres Chain, opening on Monday the 7th of September 1931. The Theatre was designed by Cecil Masey whose exterior treatment for the Theatre was in the Italian Renaissance Style, the Theatre's lavish and vast cathedral like interior, seating nearly 4,000 people, was designed in the Gothic Style by Theodore Komisarjevsky. The Granada Theatre, although primarily built as a Cinema, was also equipped with a large stage, 58 foot wide by 30 foot deep, along with under stage Dressing Rooms for artistes, a Wurlitzer Theatre Organ, and a large Cafe for the Theatre's patrons, which was was situated over the Theatre's Foyer. Also included was a car park for 250 cars, and, unusually, a pram park as well. Right - A report on the highlights of the soon to be opened Granada Theatre, Tooting - From the Bioscope Cinema Magazine, August 26th 1931. 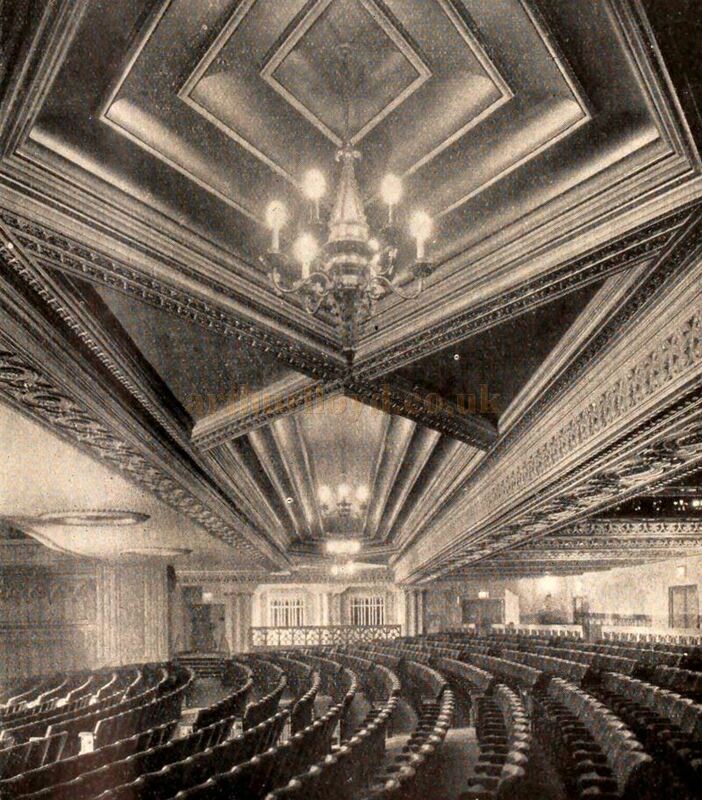 Above - The Auditorium of the Granada Theatre, Tooting - From the Bioscope Cinema Magazine of September 1931. 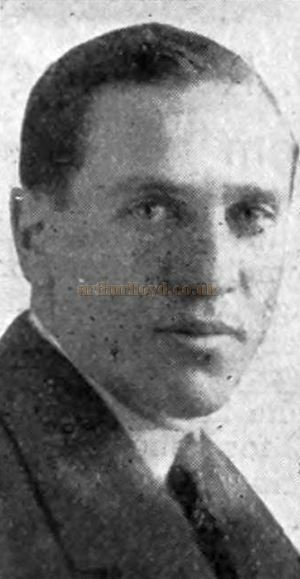 ...The reason is that the decorative artist, Komisarjevsky, has taken the architectural structure of Cecil Masey and has treated it from a standpoint almost approaching Bolshevism in art. Where normal cathedral treatment would call for rich, dark oak and flat planes, in cool greys and whites, Komisarjevsky has, to be colloquial, "jazzed it up a bit " at the Granada. He has introduced riots of startling colour. The stained glass in the Gothic windows is not the stained glass of cathedrals, but the stained glass of suburban doorways. Ornament is added to ornament, period to period, and reverence for the congruous is deliberately flouted. This is not necessarily a criticism. On the contrary, it is probably a description of which Komisarjevsky and those who admire his work will approve without reserve. The very incongruities which might be regarded as criticisms are obviously the result, not of ignorance, but of deliberate intention to wed an old tradition to a new form and embellish an accepted classic standard with a deliberate disregard of everything save an effect.
" Vital . . . Hectic . . . Not Sedate "
That effect will be appreciated or not in the degree to which the observer has a reverence for traditional form. He is really seeing in this modern beautiful house an attempt to do in architecture what has been done in other arts. The modern composer has taken Bach and Beethoven and stretched them out into new forms and shapes and overlaid them with jazz. It is as well to admit that when the first sense of outrage has passed, the average listener, as apart from the musical purist, has come to accept the jazz-classic composition as, at the least, a pleasant change. It is at any rate vital: it is hectic and, in accordance with the demands of modern taste, it is in open revolt against the sedate, the conservative and, perhaps, the dull. In the same way the Granada, Tooting, will undoubtedly have an enormous popular appeal. The austere critic will have his own opinion as to the legitimacy of the means employed and the satisfying quality of the finished ensemble. He will probably protest and ask why an entirely new architectural or decorative form should not be preferred to a bold mixture of all previous established forms.
" This Is True Cinema "
But these are criticisms the man in the Tooting street will neither voice nor hear. He will find in the Granada, Tooting, an atmosphere of freshness and gaiety and lavish magnificence quite in keeping with the meretricious and often irreverent modernity of the films shown, and no more solid justification of the Granada scheme could be given. 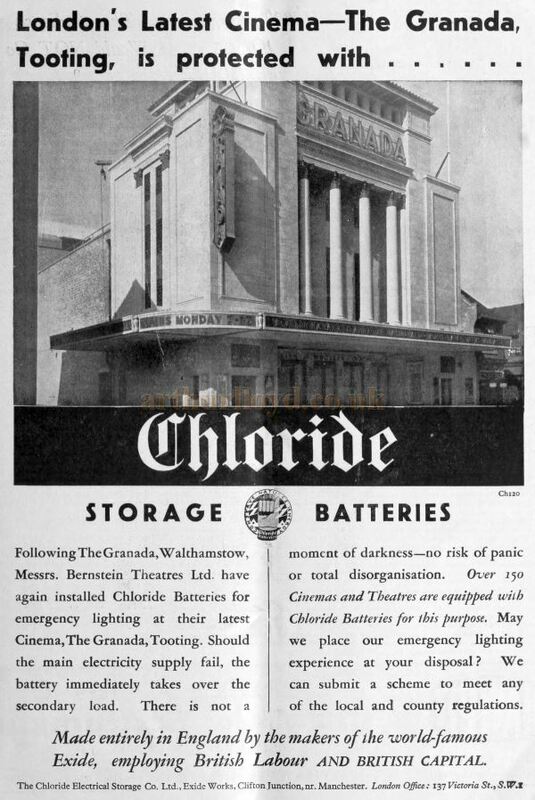 Right - An Advertisement for Chloride Storage Batteries, as fitted in the Granada Theatre, Tooting - From the Bioscope Cinema Magazine of October 7th 1931. What does it matter if the long, cool cloisters at the rear of the stalls turn out to have pink carpets and elaborate mirrors in each niche, with wrought-iron electric candelabra in front of them? A walk through cloisters is usually a restful, sober and soothing performance. Here it is something of an alert adventure, for endless reflections of one's self dart out at one at each step. Undoubtedly this is true cinema and not cathedral; the atmosphere of excitement, of self-exaltation, of gratified vanity and of stimulated expectation. The house is essentially one which must be seen to be appreciated, for verbal description is as inadequate as black-and-white pictures to convey the agitation, vividness of colour and endless succession of shocks which must impress every visitor. The coved sky ceiling in greenish blue over the auditorium gives place over the balcony to a rich and heavily coffered metal ceiling of unbelievable weightiness. The front of the house at each side of the proscenium is made interesting by a succession of contrasting features. There is on each side a huge stained glass window illuminated from behind, followed by a pointed arch on squat pillars over the entrances and surmounted by three tiers of modernised angel choir arcades illuminated inside and decorated with formal stars on a pale blue background. The pendant carved screen over the proscenium is singularly beautiful and effective. Functionally, the theatre has many points of interest. It has only one balcony, divided into an upper circle and a dress circle by a huge gangway. The balcony, incidentally, exceeds by several feet the previous largest in London, and has a span of 123 feet. The sight lines are admirable. The seating is uniform throughout, and is unusually roomy, having 2 ft. 9 in. legroom, or 5 in. more than any other cinema in the country. The ventilating arrangements are particularly efficient, and the boiler room in the basement under the foyer is one of the finest and largest in the country. The Plenum chamber is capable of pumping 3,000,000 cubic feet of cooled or heated air into the theatre hourly, dust and impure air being withdrawn from under the seats all over the auditorium. The stage has a 58-ft. opening, is fully equipped and about 30 ft. deep. Special praise must be given for the way in which natural lighting has been made use of. The staircases, for instance, do not call for artificial light during daylight hours; the dressing-rooms, which are ingeniously accommodated beneath the stage, have also natural lighting. Reference should also be made to the clever window effects in the auditorium itself, which, by means of lighting, create the illusion of stained-glass windows looking into the open-air. Another notable feature is that, as a result of careful study of his acoustic problems, Mr. Masey has succeeded in building an auditorium with really excellent acoustic properties, without the use of acoustic materials at any point. There is a car park capable of accommodating 250 cars, and another service feature which will be appreciated by Tooting mothers is a spacious pram park. The cafe is something entirely new to the cinema world, the kitchens being run solely by electricity, which ensures perfect and speedy cooking. The decorative scheme here is very cheerful and will give the effect of sunlight on the dreariest of days. At the snack-bar anything from a sandwich to a grilled steak (which can be served in three minutes) can be secured with the utmost speed and served in the daintiest manner. The projection box contains three Ross projectors, a Master Brenograph and two Brenkert spots. The sound system installed is Western Electric. The classical exterior of the house is in the Italian Renaissance, and splendid use has been made of Shaws Faience, the facade being broken up by original columns with bronze capitals. The above text in quotes was first published in the Bioscope, 9th of September 1931. The Tooting Granada opened on Monday the 7th of September 1931, the Bioscope Cinema Magazine reported on the opening events in their September the 9th edition saying:- 'Sidney Bernstein's mammoth new theatre, the Granada, Tooting Broadway, was packed to suffocation for the opening performance on Monday evening. Among the principal visitors were representatives of every section of the industry, including Sam Eckman, Jnr. (M.G.M. ), R. V. Crow (President, C.E.A. ), J. Kennedy (P.D.C. ), Michael Balcon (Gainsborough), Arthur Dent (Wardour), Earl Kramer, S. Frank Ditcham (Universal), Alex. B. King, Phil Hyams, Major A. J. Gale, Will Evans, Victor Saville, Joseph Grossman (B.I.P. ), Ralph Bromhead (A.B.C. ), R. Sutton Dawes (Fox) and G. Jacques (Western Electric). Right - Sydney Bernstein - From the Bioscope Cinema Magazine, September 9th 1931. Instead of introducing en masse architects, designers and others responsible for the development of the theatre, each individual walked on to a half-darkened stage, their names being announced through two loud speakers in view of the audience. A further novelty, and one which paid a nice compliment to the hundreds of workmen who had been engaged in the actual constructional work, was provided by the introduction of an impressionistic film suggesting mechanism and labour. Silhouettes of actual workmen were reflected through the screen from the rear, and forming a rhythmic part of the picture. The actual opening ceremony also was as surprising as it was brief. A background representing the front elevation of the Granada had been erected on the stage and a diminutive girl was driven to the "main entrance" in a Baby Austin. There she alighted and from the steps of the theatre declared the place open. A surprise item in the programme proved to be the original "Ben-Hur" film made in one day in 1908 by Sydney Olcott. The posturing of Roman "crowds," numbering not more than 20 or 30 people, provoked paroxysms of laughter. It was a staggering example of a quarter of a century's progress in motion picture art. Jack Buchanan, who was unable to appear in person, was able to make a special screen appearance, in which he explained his absence and wished success to the Granada. He was later seen in his Paramount production, "Monte Carlo," which was the featured film. "Two Crowded Hours," the Fox British production, and "Oh ! Oh ! Cleopatra," the highly successful Masquer Club production handled by P.D.C., were the supporting items, together with the special Paramount Granada Sound News reel. Probably the most impressive item in the programme, however, was the organ recital given by Alex Taylor on the mighty new Wurlitzer, the stage being flooded in varying coloured lights, and a spotlight picked out a grand piano, which, synchronously operated from the organ console, played as though by invisible hands. At a private reception given in the American buffet - which is a feature of the Granada - the Bernstein Brothers and their chief staff were highly complimented on the success of the "first night." Above - The Granada Theatre, Tooting - From a Chloride Batteries Advertisement in the Bioscope Cinema Magazine of October the 7th 1931. 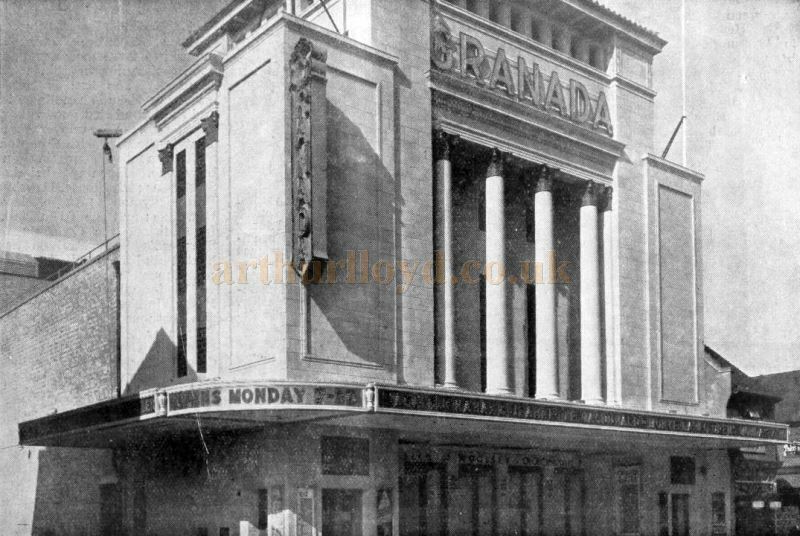 The Granada Theatre opened on Monday the 7th of September 1931 and went on to have a long life as a Cinema and Theatre. Showing mostly Granada Films at the beginning, along with the occasional Odeon release, the Theatre was also used to stage some elaborate productions including, notably, the 1948 productions of 'Goodnight Vienna' and 'The Dancing Years' which both ran for an entire week each at the Theatre. In the 1930s the Theatre was regularly home to Christmas Pantomimes, and for four years from 1934 it was even used to stage Circus shows with real elephants, along with its film showings. Above - A publicity stunt for the film 'The Devil To Pay' at the Tooting Granada in 1931 - From the Bioscope of November 25th 1931. 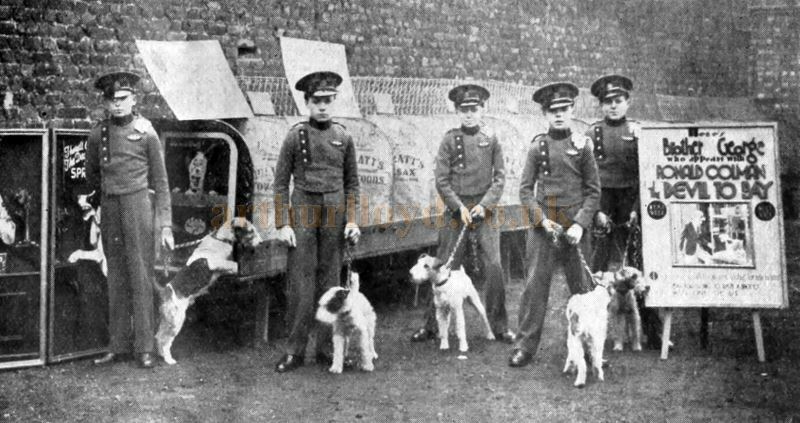 Caption reads: 'Six "Brother Georges " are on view at the Granada, Tooting, as part of a publicity scheme for "The Devil to Pay," in which United Artists' picture Ronald Colman is "supported" by a terrier. The dogs are to be presented to patrons who correctly guess their names. The idea forms a tie-up with Spratt's'. A plethora of well known stars of the stage and screen performed on the Granada's stage over the years including Danny Kaye, Lena Horne, Frank Sinatra, Guy Mitchell, The Andrews Sisters, Max Bygraves, Dickie Valentine, Johnny Ray, Frankie Laine, Pat Boone, Jerry Lee Lewis, Little Richard, Dusty Springfield, The Rolling Stones, Roy Orbison, and The Beatles. The last live show on the Granada's stage however, would come on the 28th of August 1966 when the Bee Gees performed in concert to a packed house. The Theatre's Cafe was closed in 1954 and the space was never reused although it still exists in the building to this day. The Theatre itself was under threat of demolition in 1971 when applications were made to construct an office building on its site. Thankfully however, the Theatre was granted a Grade II Listed Building status and the demolition plans never came to fruition, but the vast Theatre, which had been running with very low attendances for a number of years, was eventually forced to close on the 10th of November 1973. The Theatre then remained closed for a number of years before being reopened as a Granada Bingo club in October 1976. This was taken over by Gala Bingo in 1991 who continue to run it as such even today (2017). Such is the magnificence of the building, especially internally, that the Theatre's Grade II Listing was upgraded to Grade I in September 2000, thankfully safeguarding its future. The Theatre's orchestra pit which had been covered over or most of its Bingo years, has since been reinstated, and the Theatre's Wurlitzer Theatre Organ was restored to full operation in 2007. 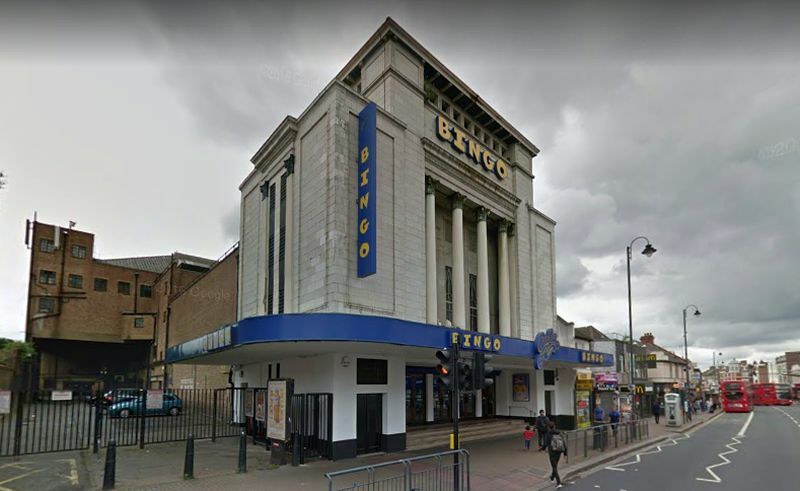 You may like to visit Gala Bingo's own website for the Tooting Granada's here. 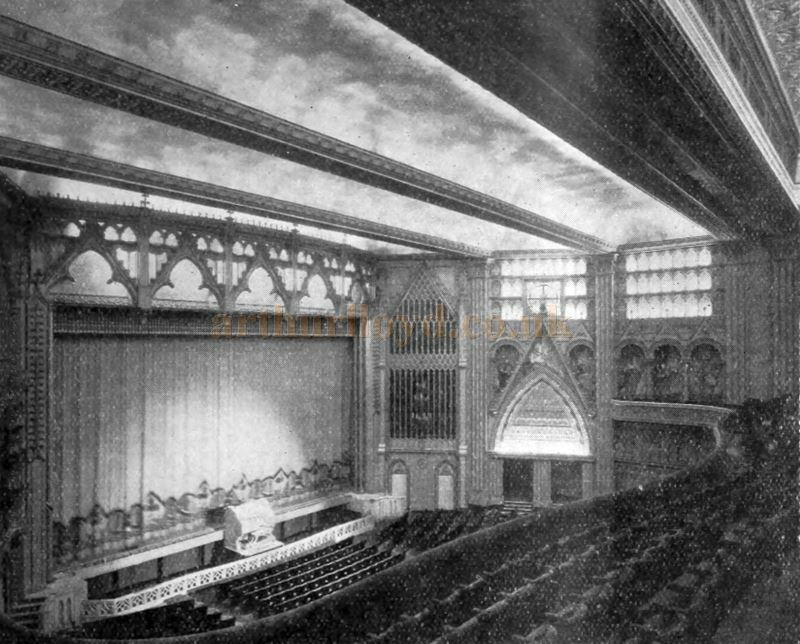 Some of the above information on the Theatre's later history was gleaned from the excelent Cinema Treasures Website.